The electrical output is decided by the power available at the engine flywheel. Engines are usually rated on a continuous basis against Standard Reference Conditions, defined in BS 5514: Part 1 (ISO 3046) as 1000kN/m2 barometric pressure, 27°C air temperature and 60% relative humidity. Industrial diesel engines built to standard specifications will handle 10% overload for 1 hour in any 12 hours of operation at the continuous rated load. This overload rating is frequently used as a continuous standby rating on the assumption that normal industrial loads are of a fluctuating nature and standby duty is relatively infrequent. Some engines are assigned a special standby rating by the manufacturer which may be higher than the 10% overload rating but in such cases a restriction on total engine service life may be imposed. Part 3 allows a 10% generator overload rating for 1 hour in 12, providing the cooling air temperature is not more than 27°C. As in the case of the engine, this overload rating can be used as a standby rating for fluctuating industrial loads. The majority of engines used are of the four cycle type (also known as four stroke) in which each cylinder contributes one power stroke for every two revolutions of the crankshaft; the two cycle (or two stroke) engine giving one power stroke per revolution is not much used. In general terms the number of cylinders increases with the power output of the set and while twin-cylinder engines are frequently used for small sets, twelve and sixteen cylinder engines are popular for the larger outputs and six and eight cylinder engines predominate for the most popular middle part of the output range. Development of diesel fuel pumps has resulted in the ability to inject increasing quantities of fuel into the cylinders to give greater power output. To burn this fuel a corresponding increase in the air input is required, and natural aspiration, in which the air is injected at atmospheric pressure, severely limits the engine output. Consequently, much development has been done on pressure charging whereby the mass flow of air is increased by raising its pressure, usually achieved by an exhaust turbocharger. Turbocharging results in substantial power increase and because of this most diesel sets are turbocharged engines. 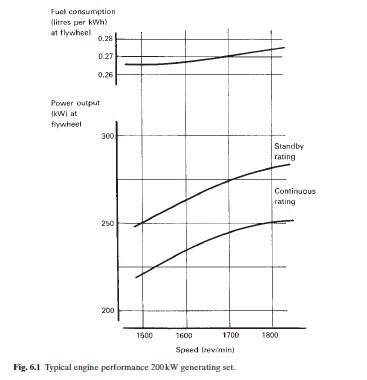 Figure 6.1 shows typical performance graphs for the diesel engine of a 200kW generating set, giving figures for the continuous and also the standby ratings, and it will be seen that fuel consumption per kWh is fairly constant over a wide range of speed and load, although generating sets operate at a fixed nominal speed which is maintained by a governor and fuel pump.